Still considered the most versatile player in Ohio State University football history, Janowicz was a triple threat: running as a halfback, passing and kicking, and playing safety on defense. His greatest season came in 1950, his junior year, when he won All American honors and the Heisman Trophy. Janowicz was a rarity in professional sports, playing both baseball and football. He signed a bonus with the Pittsburgh Pirates in 1953. After two years during which he saw little action, Janowicz signed with the Washington Redskins. He was the NFL’s second-leading scorer for the 1955 season. His football career ended when he was severely injured in a near-fatal automobile accident. He died Feb. 27, 1996, in Columbus. Vic Janowicz, son of Polish immigrants, is still considered the most versatile football player in Ohio State University gridiron history. The late Woody Hayes, who began his coaching career at Ohio State in Janowicz’s senior season (1951), said the little scatback did it all. Janowicz had his greatest season as a junior and capped it by winning the coveted Heisman trophy in 1950 and being named to every All-American team. University of Michigan fans remember Janowicz’s performance in that season’s final game, played in a blizzard in Columbus. 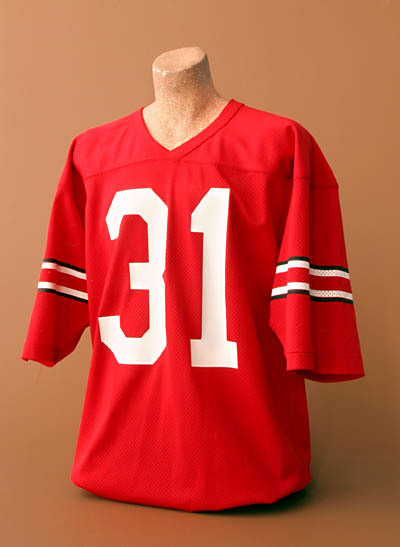 The Wolverines won the “Snow Bowl”, 9-3, but the Elyria, Ohio native kept the Buckeyes in the game with his punting: 21 times for 672 yards, both still single-game OSU records. He kicked a 27-yard field goal into a 40-mile-an-hour wind for the Buckeyes’ only points. Janowicz also holds the Ohio State record for most extra points in a game when he was a perfect 10-for-10 against Iowa in 1950. He also scored two touchdowns and passed for four more in the lopsided 83-21 victory over the Hawkeyes. Janowicz is a rarity in professional sports by having played both major league baseball and football. After serving in the Army, he signed a $25,000 bonus contract with the Pittsburgh Pirates, a remarkable feat considering he hadn’t played organized baseball since graduating from high school six years earlier. Severely handicapped without minor league experience and the victim of a bonus-baby rule that required a player to remain in the major leagues for two years, Janowicz, a catcher and third baseman, saw little action in the 1953 and 1954 seasons. 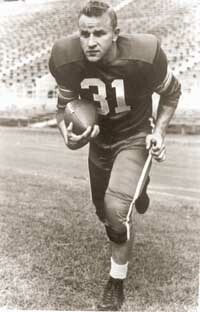 Following the 1954 baseball season, Janowicz returned to football and signed with the Washington Redskins. Despite having been away from the game for two years, he made the team. He became Washington’s starting halfback by the end of the season. In 1955, he was the NFL’s leading scorer until the final week of the season. Janowicz had run, kicked and caught passes for 88 points, only to be beaten out in the last game of the season by the Detroit Lions’ versatile Doak Walker, who finished with 96 points. The one-time collegiate star appeared headed for an outstanding professional football career until tragedy struck following a 1956 pre-season game in Los Angeles. Janowicz was injured in a near-fatal automobile accident, suffering a massive head injury that caused a creeping paralysis of the left side of his body over the next two years. Determined to regain his health, Janowicz was moved to Columbus and began a rigorous program of physical therapy. He eventually made an amazing recovery. Janowicz died in 1996.